For the third consecutive year, the National Chambord domain is preparing to celebrate the holiday season! Under the theme of storytelling, François 1er castle is welcoming kids and adults around many animations, magical decorations and a unique show. 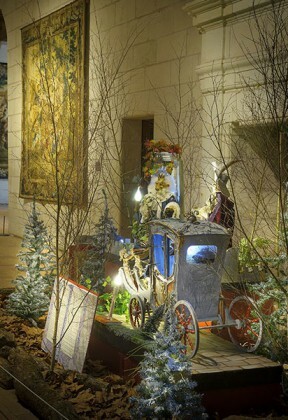 Visitors can admire the decorations castle until January 3rd. On the ground floor of the castle, you discover six scenes and automatons from the Tales of Perrault: The Sleeping Beauty, Cinderella, Little Red Riding Hood, Puss in Boots, Donkey Skin and Tom Thumb. With unique decors: castle, cottage, ruins, coaches … and enchanting characters, a whole legendary universe will fill Chambord with fantasy and poetry, until January 3rd, on the ground floor of the castle. The new show with animals “But where is Santa Claus”, which runs from December 26th to 30th, wins our vote. Played by the team of Alméria Parc, it transports children and adults to the North Pole in the company of Crystal, the Snow Fairy, the Head of elves, Mother Christmas, terrible bugaboo and their pet friends: a raptor, a sheep, Julia roe deer, the oracle rabbit and a magic unicorn. In this commemoration year of the 500 years of the advent of François I on the throne of France, Chambord also offers an exhibition for young audiences about the king. A. F.-M.